Georgia's president has cut short a visit to the World Economic Forum in Switzerland and headed home to deal with a growing energy crisis. 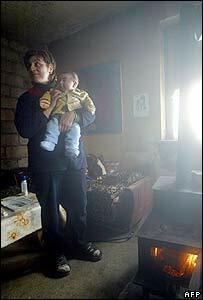 Mikhail Saakashvili said his country had used up its gas reserves and electricity blackouts were widespread. 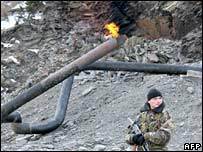 Bad weather has damaged power lines and explosions on the main pipeline from Russia last weekend hit gas supplies. Schools are shut and power is restricted to hospitals, bakeries and water pumping stations. Prime Minister Zurab Noghaideli said Georgia had been under a virtual energy blockade for the past five days while enduring record freezing temperatures. What are [the authorities] there for if the whole country is freezing? He accused Russian gas supplier Gazprom of failing to boost gas supplies via Azerbaijan to compensate for the damaged pipeline which, he said, had still not been fully repaired. "Either they should stop saying Gazprom is giving Azerbaijan additional gas for Georgia or, if they can, they should actually supply this gas to Azerbaijan so that we can receive it," Mr Noghaideli told a Georgian TV station. Gas cylinders have been at a premium in the capital, Tbilisi, correspondents report. "There are old people queuing up who don't have their own cars to carry these heavy canisters," housewife Keti Rurua told AFP news agency after queuing two hours herself. "The trolley-buses aren't running even in the town centre." One angry pensioner, Irakli Gogokhidze, attacked the government's handling of the crisis. "The electricity went off at one in the morning and since then we've been freezing," he said. "It's awful that the authorities can't solve this problem. What are they there for if the whole country is freezing?"